how much for gatomon and can you ship to denmark?? OMG! That looks so cute!!! I do, however I have a waitlist on my journal of the people in line for commissions and I can't work on anything until after Acen. eh. Its okay, its just...the body seems a little to tall for Gatomon. That all depends on what season Gatomon you're looking for. I asked her to make it based off season 2 Gatomon, where she is taller and more lean. oh ok, I get it. I haven't seen season 2 (never mind heard of it). Thx! Sweetness! Did you need to handsew the purple stripe around her tail? Or how did you do it? It looks awesome. haha well everyone knows the size of a coke can XD it was an easy way for me to show the size And thanks! Whoa! That looks awesome! *U* Love it! Rock on! Would you be able to do a commission for a Gatomon like this? :3 I'm a major fan and would love a Gatomon to cuddle. Cool - is the Gatomon life-size (like in the series) ? Out of curiosity, are you doing commissions for plushies by any chance ? 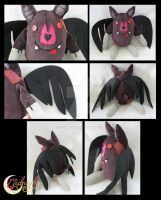 sweet just wondering how much would it be for a biyomon? This brings me back... The original Digimon rocked! Why can't (the majority of) modern cartoons measure up?